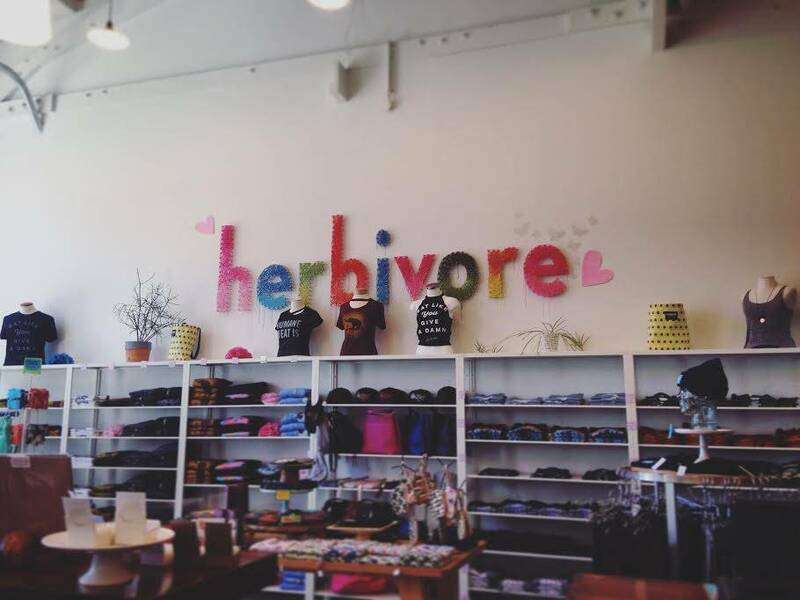 Big Hello from the Herbivore Clothing Store! For those of you who haven't had the chance to visit our store, welcome! It's great to have you here. This will be a little online tour and intro so that all customers and friends can be familiar with us, whether or not we live miles apart. For those of you who haven't had the chance to visit our store, welcome! It's great to have you here. This will be a little online tour and intro so that all customers and friends can be familiar with us, whether or not we live miles apart. We appreciate all your long-distance love and support! We are located in SE Portland, on a block known as the "Vegan Mini-Mall" (yeah, it's just as awesome as it sounds). Our shop is nestled between Sweet Pea (a vegan bakery/cafe), Food Fight (a vegan grocery) and Scapegoat Tattoo (a vegan tattoo studio). That means that vegan snacks, pastries, salads, coffees, and tattoos are just a hop skip and a jump away-- literally. Here's a picture of Krysti and Michelle enjoying one of the only sunny days we've had this month. Oh, that's the one downfall to Portland: it stays pretty wet for most of the year. The upside? We get to watch lush green forests spring up everywhere, and our gardens get PLENTY of watering on their own. We opened our doors in 2007, and we absolutely love being here. The vegan community in Portland (especially Southeast) is thriving, growing, and very welcoming. Along with our regulars, neighbors, and friends, we get a lot of customers in the store from other states and countries. We are so flattered when y'all put aside precious vacation hours to visit us. That's a wonderful feeling! "Herbivore" is our brand. We print our designs on shirts, hats, wallets, totes, stickers, patches, magnets, and pins! We import materials to make our own brand of bags, belts, and wallets. We also collaborate with various groups and people in Portland to produce some of our products! We are constantly working on new ideas and products that are both stylish and made with quality materials in the USA. Being a responsible producer is something we take very seriously, because being vegan means more than caring about just our bodies' health. We want to positively impact our community and planet as a whole. We also carry a wide variety of vegan products from other vendors and brands, including jewelry made by a vegan artist, locally-produced socks, cards made from local presses as well as artists overseas, naturally-scented soaps, lip balms, and candles concocted in small batches in Wisconsin, a huge variety of cookbooks from everywhere imaginable, and much more! Anyway, we really appreciate you taking the time to learn more about who we are, where we come from, and why we love being here and being part of this vegan community. If you're in the area, don't be shy-- come in, say hello, bring your dog if you have one (PLEASE! We have vegan doggie treats! ), tell us about your travels or when and why you made the choice to live compassionately.